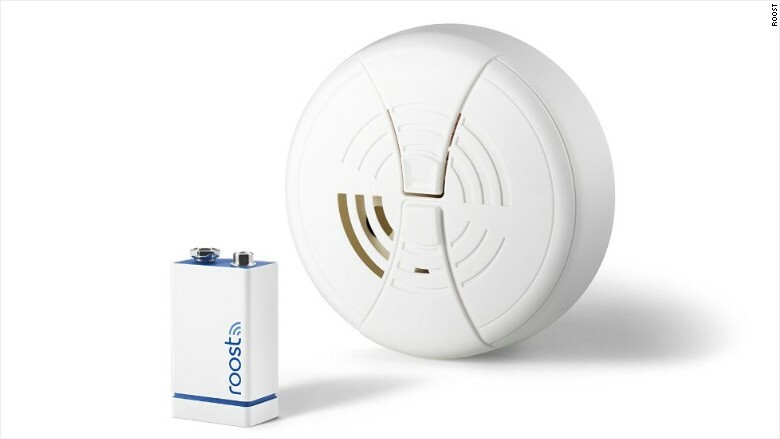 If there's one smart home device worth trying, it might be the Roost smart smoke alarm battery. If there's one dumb device in your home worth making smart, it's your smoke detector. It chirps when your battery is low (inevitably at 3 a.m.), it goes off when you're making stir-fry, and you have to stand on a chair or get out a dish towel to silence it. Most importantly, if there's a real emergency when you're away from home, there's no way for you to know about it. There are two main solutions to the problem: Buy a home security system, or buy a bunch of $99 Nest Protect smoke alarms. They're expensive options, and they require installation. But on Wednesday, a third, much cheaper and simpler option became available. The Roost, a $35 9-Volt Wi-Fi battery for your smoke alarm, will notify your smartphone when your smoke detector is going off, it will let you silence your smoke alarm from an app, and it will send low-battery alerts to your phone -- no more 3 a.m. wakeups. The Roost battery has a Wi-Fi radio and a microphone. The microphone picks up the sound of your smoke dectector's alarm and transmits the alert to your phone via Wi-Fi. The Roost became available for pre-orders on Amazon Wednesday and will start shipping in September. At $35 (or $65 for two), it's not the cheapest single-function product in the world. But Roost claims that the battery will last five years, and replacements will cost just $15. The brilliance of Roost is its retrofit concept. It doesn't require you to replace your current smoke alarms -- you just have to swap out the battery (which you need to do a couple times a year anyway). "You can buy a smart dishwasher that texts you when it's done, but nobody cares about that," said Roel Peeters, CEO and co-founder of Roost. "But when your smoke alarm goes off when you're not at home and you get a notification, that's very valuable." The set-up process is simple. After downloading the Roost app, you enter your phone number, your name, your email address, and you select your Wi-Fi network. Your phone will then send an audio signal to the Roost battery that sounds like a 56k modem dialing up (if you were born after 1995, look up "dial-up modem" on YouTube). After that, you put the battery in your smoke detector and (hopefully) forget about it for five years. If you've been resistant to the wave of smart home products, Roost might be the smart device that will change your mind.